Hi parents! Every parents want the best for their children but sometimes they don't know how to do it and sometimes over do it. Here I will share you the tips for raising muslim children by Mufti Menk. As a Muslim, there is a guideline for us to educate our children especially when it comes to pray or salah. 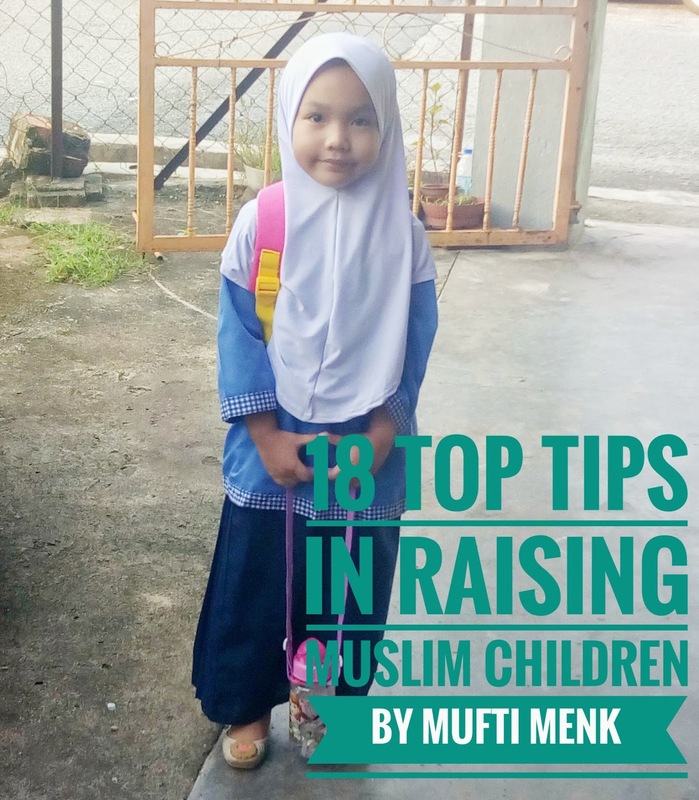 So hopefully with this 18 Top Tips for Raising Muslim Children from the great Mufti Ismail Menk it will helps us to educate our children wisely. 1. Praise your child, even if they get 4/10 in an exam, praise your child in front of others. 2. Never make your child feel that he or she is useless. Never favour one child over the other. 3. Every time you speak with your children, speak with respect, say “Jazakallahu khair ”, etc. Don’t use slang such as ‘gimme’, instead say ‘please give me’; use clear words, be polite and never swear. 4. You need to bear in mind when your child is young that he or she is just a child, don’t take away their playing time by treating them like adults. If you do this, they will rebel in life. 5. Assist your children in making decisions. He or she must be taught to make decisions. Acknowledge them, guide them by talking to them. If they want to go go for something, then help them plan. 6. Whenever you have decisions to make, ask your child for his or her opinion. For example, if you are going to buy a car, ask them what colour they’d like the car to be. This develops the habit of consultancy in them. 7. If possible, dedicate a corner of the house to your child and write the name of your child there – make it their little space. Put their certificates on the wall; this will make them more confident of themselves. 8. Teach your child to follow you in salah. Lead them rather than merely instructing, it’s a more powerful way to teach them. Your child will remember what he/she sees you doing forever. Start instructing them to read salah at the age of 7, this will help make it easy for them to pray when they reach puberty and it becomes compulsory on them. 9. Teach your children how to put forward their opinions and how to disagree on matters. Don’t use swear words or be aggressive when you disagree on anything as this will be picked up by your child. Children pick up things very fast. 10. Encourage your child to ask questions and try to answer each question. Otherwise, they will get the answer from the wrong source. Praise their questions at times. 11. Always fulfill your promises to your children. Do not make big promises which you cannot fulfill; this makes them develop a habit of making false promises. If you fail to fulfill any promise, explain. 12. It is very important to teach your child how to develop skills of being a member of a group. Team work is very important; this teaches them to give chances to people in life rather always competing. 13. Make dua for your children. Even if they have gone astray, pray for them. 14. Tell them you might fail once, but never lose hope. Teach them how they should react to a failure. 15. Apologize to your child if you have made a mistake, this teaches your child to repent to Allah. Don’t raise ifs and buts when you are wrong; there are no ifs and buts when it comes to repentance. 16. Have a few surprises for your children, to praise their good deeds, give them recognition at home and explain to them that this surprise is for the good deeds that you did. 17. Make sure you train your children to read a portion of Quran daily, according to their capacity. 18. Tell your child repeatedly that you love them, tell them how gorgeous they are and how important they are to you, hug them, its a sunnah to kiss your children. Its easy right? so lets start to do it! If you feel this message will help one or more of your family or friends, forward this message to them. Perhaps this might be beneficial for them and you will get the ajar for them. Thanks for your practical tips. I have followed your blog. No 445. Do check out mine too... TQ.